Above: A fresh, 6-meter-wide, 1.33-meter-deep crater on Mars photographed on Oct. 18, 2008, and again on Jan. 14, 2009, by Mars Reconnaissance Orbiter's HiRISE camera. The bright material is ice, which fades from Oct. to Jan. because of sublimation and obscuration by settling dust. 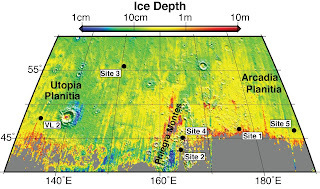 Above: This map shows five locations where fresh impact cratering has excavated water ice from just beneath the surface of Mars (sites 1 through 5) and the Viking Lander 2 landing site (VL2), in the context of color coding to indicate estimated depth to ice. This is very heartening news from Mars. We obviously have large reservoirs of water stored in surface ponds only moderately covered by protective dust. That certainly means that establishing a working exploration base has become feasible. Assuming an energy source is brought along it is simple engineering to put up atmospheric bubbles to produce a living environments for human occupation that is potentially self sustaining in terms of the basics of life. The main issue was access to water at all and in fact access to ample supplies was necessary for a sustained major effort. This requirement now appears amply satisfied. Of course, we might be looking at a lot of sublimated water adhering to the underlying dust exposed by the impact, yet there will still be plenty of water. Sublimated onto sand grains is the most likely explanation since any solid ice would be wind swept and fully exposed. This also explains the quick change of color. This broadly confirms that establishing a presence on Mars will mean mostly moving materials, initial supplies and a powerful energy source. This can be done through a stream of small cargos on Landers, if nothing else is then possible. Not likely, but establishing a base on Mars could be more practical that one on the moon were even water must be delivered. At least the initial availability of key raw materials for life cuts the operating costs to manageable levels. It also opens the door for sending an initial team on what could be a deliberate one way trip to build out the station and set up equipment as it is landed. Once enough is built out, it then would become possible to retrieve them by landing the components of a return craft. It is not pretty, but it could just make it feasible in the first place. This option becomes possible because of ample water availability from the very beginning. September 24, 2009: Meteorites recently striking Mars have exposed deposits of frozen water not far below the Martian surface. Pictures of the impact sites taken by NASA's Mars Reconnaissance Orbiter show that frozen water may be available to explorers of the Red Planet at lower latitudes than previously thought. "This ice is a relic of a more humid climate from perhaps just several thousand years ago," says Shane Byrne of the University of Arizona, Tucson. Byrne is a member of the team operating the orbiter's High Resolution Imaging Science Experiment, or HiRISE camera, which captured the unprecedented images. Byrne and 17 co-authors report the findings in the Sept. 25 edition of the journal Science. "We now know we can use new impact sites as places to look for ice in the shallow subsurface," adds Megan Kennedy of Malin Space Science Systems in San Diego, a co-author of the paper and member of the team operating the orbiter's Context Camera. So far, the camera team has found bright ice exposed at five Martian sites with new craters that range in depth from approximately half a meter to 2.5 meters (1.5 feet to 8 feet). The craters did not exist in earlier images of the same sites. Bright patches darkened in the weeks following initial observations, as freshly exposed ice vaporized into the thin Martian atmosphere. The finds indicate water-ice occurs beneath Mars' surface halfway between the north pole and the equator, a lower latitude than expected in the dry Martian climate. During a typical week, the spacecraft's Context Camera returns more than 200 images of Mars that cover a total area greater than California. The camera team examines each image, sometimes finding dark spots that fresh, small craters make in terrain covered with dust. Checking earlier photos of the same areas can confirm a feature is new. In this way, the team has found more than 100 fresh impact sites. An image from the camera on Aug. 10, 2008, showed apparent cratering that occurred after an image of the same ground was taken 67 days earlier. The opportunity to study such a fresh impact site prompted a look by the orbiter's higher resolution camera on Sept. 12, 2009, confirming a cluster of small craters. The bright material at that site did not cover enough area for a spectrometer instrument on the orbiter to determine its composition. "Was it really ice?" the team wondered. The answer came from another crater with a much larger area of bright material. "We were excited [when we saw it], so we did a quick-turnaround observation," said co-author Kim Seelos of Johns Hopkins University Applied Physics Laboratory in Laurel, Md. "Everyone thought it was water-ice, but it was important to get the spectrum for confirmation." Mars Reconnaissance Orbiter Project Scientist Rich Zurek, of NASA's Jet Propulsion Laboratory, Pasadena, Calif., said, "This mission is designed to facilitate coordination and quick response by the science teams. That makes it possible to detect and understand rapidly changing features." The ice exposed by fresh impacts suggests that NASA's Viking Lander 2, digging into mid-latitude Mars in 1976, might have struck ice if it had dug only 10 centimeters (4 inches) deeper. The Viking 2 mission, which consisted of an orbiter and a lander, launched in September 1975 and became one of the first two space probes to land successfully on the Martian surface. The Viking 1 and 2 landers characterized the structure and composition of the atmosphere and surface. They also conducted on-the-spot biological tests for life on another planet. To view images of the craters and learn more about the Mars Reconnaissance Orbiter visit http://www.nasa.gov/mro.